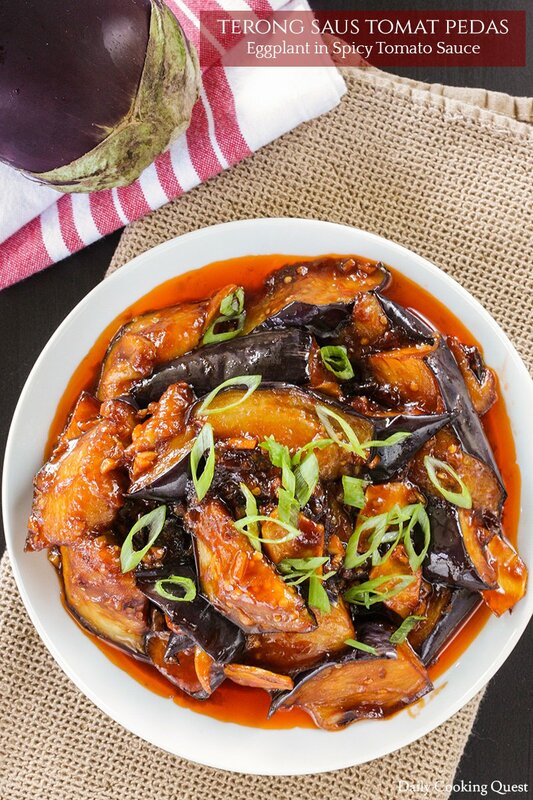 How do you prepare your eggplant? 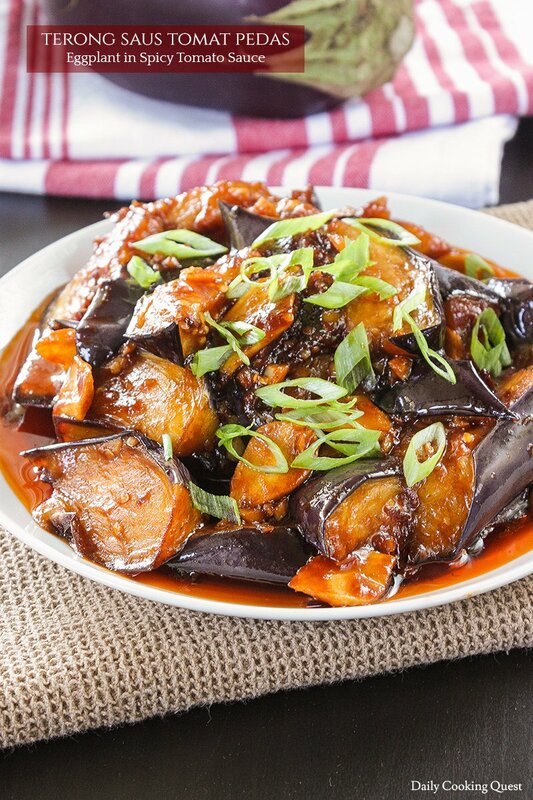 Indonesian love to prepare eggplant dishes with plenty of sauce which goes really well with steamed white rice. 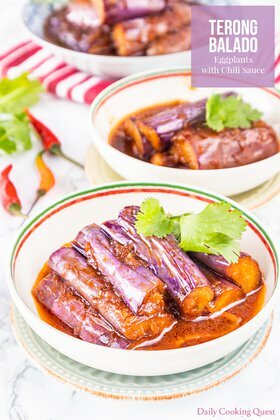 One of my favorite eggplant dish is this terong saus tomat pedas - eggplant in spicy tomato sauce. 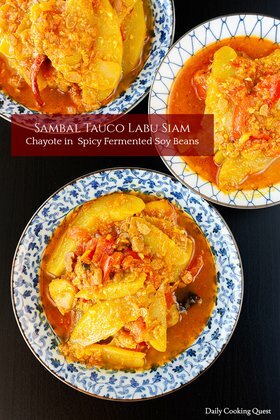 A great thing about this dish is you can adjust the strength of heat by using different types of chilies. If you want a milder dish, use fresno chilies. If you want a super spicy dish, go with Thai red chilies. And when you simply cannot tolerate any heat at all, feel free to sub with red bell pepper. 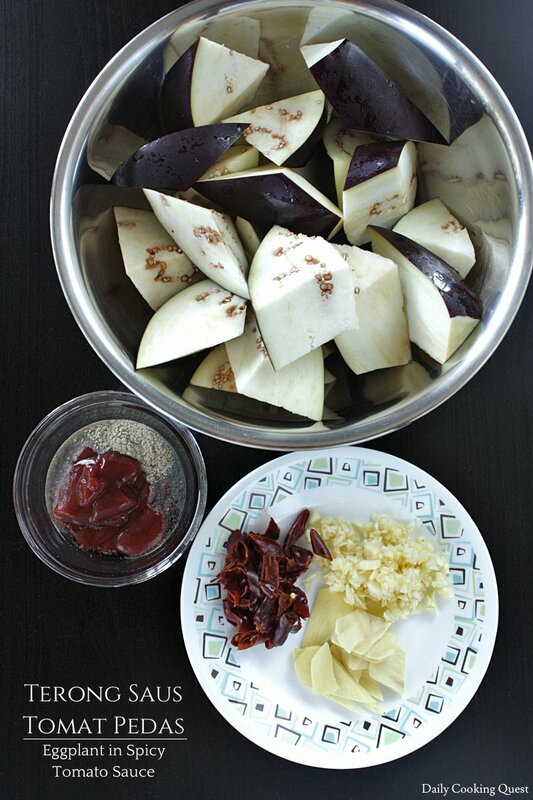 This time I use eggplant that is common in United States, which is more oval and round with a darker skin color. If you have access to Asian market, you can buy the thinner and longer eggplants. The ones you buy from Asian market is closer to what you get in Indonesia. Either way, just chop your eggplant into big bite size pieces. 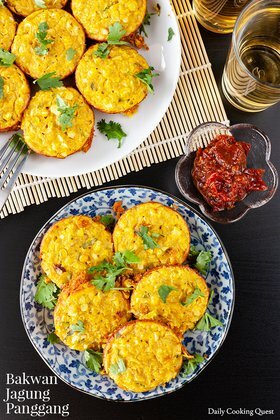 Most Indonesian eggplant dishes will require deep frying the eggplant first before further cooking with sauce. 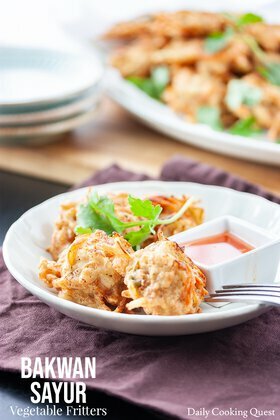 I know that deep frying is not exactly a chore most people are fond of, but when it comes to eggplant, there is no avoiding it. You can try coating with oil and roast in oven, but the final dish is just not quite the same as the one I get back at home, to my taste buds at least. Finally, it’s time to make the sauce. Simply sauté the aromatics (garlic, ginger, and chilies), and season with tomato ketchup, kecap manis, fish sauce, pepper, sugar, and water. Once the sauce boils, add the fried eggplants, and toss gently to coat. Transfer the cooked dish to a serving plate and garnish with thinly sliced scallions. Heat enough oil in a wok/pot for deep frying. Once the oil is hot, fry eggplant wedges until golden brown, set aside. In a frying pan, heat 2 tablespoon oil over medium high heat, and sauté garlic, ginger, and chilies until fragrant. Add tomato ketchup, sweet soy sauce, fish sauce, ground white pepper, sugar, and water. Mix well and bring to a boil. Once the sauce boils, return the fried eggplant into the frying pan and toss to coat with the sauce. Turn off heat, transfer to a serving plate, garnish with thinly sliced scallions, and serve immediately with steamed white rice.